MORE than nine in 10 graduates find work within six months of leaving university, a survey revealed yesterday. Human resource experts said the employment market appears rosy - despite global economic uncertainty. Those who landed full-time permanent jobs last year earned a median gross monthly salary of $3,050 - up from $3,000 in 2011. Lawyers, doctors and aerospace engineers were among the best paid. The figures were revealed in the first joint Graduate Employment Survey by the National University of Singapore (NUS), Nanyang Technological University (NTU) and Singapore Management University (SMU). More than 9,600 respondents were polled, 91 per cent of whom found employment - including part-time and temporary work. This was similar to the 91.4 per cent figure released last year, when the universities conducted their own surveys and the results were pulled together by the Manpower Ministry. Graduates from some schools fared slightly less well than before, while others found their prospects improved. At SMU, 91.7 per cent bagged work - down from 95.6 per cent last time around. NUS also recorded a dip in the proportion who found full- time permanent jobs - from 85.1 per cent to 84.1 per cent. But at NTU, the overall employment rate climbed from 90 per cent to 92 per cent in the latest survey. Salaries also varied. SMU graduates' average monthly pay climbed from $3,388 to $3,395. At NUS, the median pay cheques of graduates remained unchanged at $3,000. The biggest earners at SMU were law graduates - who earned a median monthly salary of $5,000. At NTU, however, aerospace engineering graduates topped the table, taking home a median of $3,500 a month. Human resource experts said the overall employment figures were respectable. Mr David Leong, managing director of PeopleWorldwide Consulting, said a 90 per cent employment rate is "unheard of in many countries". 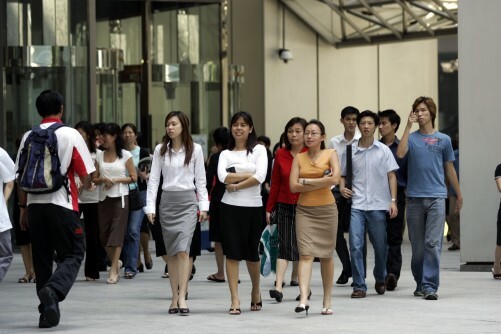 Mr Josh Goh, assistant director for corporate services at recruitment firm The GMP Group, told The Straits Times that the manpower crunch and restrictions on employment passes mean overall market conditions are expected to favour graduates. But Mr Paul Heng, managing director of NeXT Career Consulting Group Asia, said companies in banking and finance will continue to show restraint when it comes to hiring, "given the prevailing uncertainties in the global business environment". SMU graduate Cai Min, 26, had to spend almost a year applying to more than 30 companies before he found employment. The 26-year-old, who is now working in a trading house after completing a double major in economics and finance, started his job search before graduation. "The landscape is getting more competitive," he said. Mr Lance Tan, an NUS mechanical engineering graduate, said it took him about six months to find a job. But the 26-year-old research specialist described the process as quite easy. "I think my degree helped a lot, because an engineering degree is very versatile."